Here is rare information on a subject most occult books do not tackle - doll magic. The late Mr LaCroix claimed doll magic became the source of his wealth and good fortune after a rich lady gave him a set of dolls in return for a favour in the late 1940s. Doll Magic is a primitive art. Through the doll the subconscious connects with Universal Mind. Such magic is potent! Mr LaCroix's instructions are mainly concerned with (a) acquiring riches; (b) obtaining secret information; (c) curing the body of illness. IT IS DIFFICULT IF NOT IMPOSSIBLE TO OBTAIN THE MAGICAL INFORMATION HERE FROM ANY OTHER SOURCE, and it is vital to anyone with a genuine interest in changing poor to moderate luck to good. CENTRAL TO HIS INSTRUCTIONS IS THE PREMISE THAT THE DOLL, OR DOLLS THE READER MAKES, CAN BE A CRUDE AND AS BASIC AS THE ABILITY TO MAKE IT. For example, a mere stick can represent the doll's essential form. A large bead can represent the head, another stick placed across the first can represent the arms. Doll magic is but fetish magic by another name. To primitive man, a mere stone or pillar could represent a living deity. Doll magic may seem like childish nonsense, which to a scientific mind it is: but one must acquire the attitude of a child to make it work. This is beyond science, beyond the rational. Frankly, being 'scientific' or 'rational' is hardly of much value if one remains poor or ill! MAKE NO BONES ABOUT IT, THIS MAGIC IS HIGHLY CHARGED INDEED! Any person can practise doll magic, and anyone can make a crude image or effigy. or it can be as elaborate as you wish: EITHER WAY, THE MAGIC WILL OCCUR. Mr LaCroix describes how and why it works. HE NEVER LACKED MONEY AFTER WORKING WITH DOLL MAGIC. A different doll is created for each need. A green-coloured or green-marked doll is needed to obtain money; a blue for healing and health. The author tells of how one man threw away his bath chair and walking stick after 20 years, by believing in his blue doll. Another cured himself of a lifetime of rheumatism and arthritis! What lies between you and your objective and it's accomplishment is the doll you make, Mr LaCroix says. The magickal energy flows through it! The dolls take on a life of their own, as they automatically fulfil their designated purpose! But they do not control the practitioner; she/he remains in control. 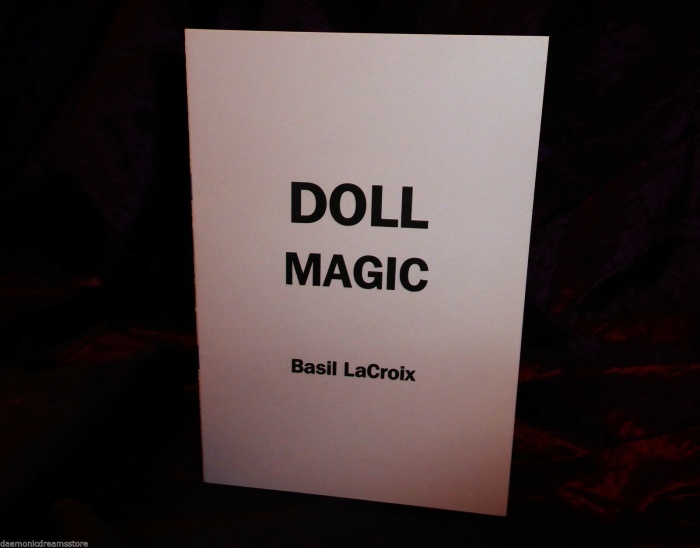 If nothing else has worked, then maybe doll magic is for you. IT FOCUSES ONE'S DESIRE AND CONCENTRATION IN A MANNER FEW OTHER OCCULT METHODS CAN. And it is easy. All that is required is the will to make what you want happen. The doll transmits your will to the Universal Mind and it is fulfilled, so says the author. Information on genuine doll magic is hard to come by. Maybe it is because 'those in the know' don't want others to know. Not anymore; all the information you need is here. The only admonition in the authors text is not to reveal its contents or your magical work with dolls, lest you be thought mad or lest you lose the power. ONCE YOU EXPERIENCE THE RESULTS YOU WILL NOT WANT OTHERS TO KNOW ANYWAY; YOU WILL WANT TO KEEP IT TO YOURSELF! 'Doll magic' is the Real McCoy, an ancient and potent art.